The What to do in San Luis Obispo County (Part 1) Section of the California Central Coast Travel Guide features the city of San Luis Obispo including its quaint downtown and notable San Luis Obispo Farmer's Market, held every Thursday evening (except on Thanksgiving). Also, includes the resort of Pismo Beach, Avila Beach and Valley, See Canyon, and Port San Luis. The county's principal city, San Luis Obispo (population 42,000), offers visitors a taste of the "old" California: less crowded, slower paced and easygoing. The city's acronym, SLO, says it all. The downtown San Luis Obispo area features many antique buildings, small shops and restaurants, and a lovely, tree-covered main street, Higuera Street. The city originally arose out of Mission San Luis Obispo de Tolosa, found in 1772. Located in the heart of downtown, the church is still active, and Mission Plaza (right) is the site of many special events throughout the year. The extremely popular Mozart Festival, held every summer, stages events on the tree-shaded plaza and elsewhere. Downtown San Luis Obispo also has its own mini-riverwalk. Wooded San Luis Obispo Creek which runs parallel to Higuera Street has been developed with walking paths and stairways to Mission Plaza and other downtown locations. Many of the restaurants have outdoor patios which overlook the creek. San Luis Obispo is centrally located, a short driving distance to numerous spectacular beaches both north and south of town. The mountain range east of the city is part of the Santa Lucia Wilderness, offering scenery and hiking. The scenic San Luis Obispo Wine Country is just south of town. Woodstock Pizza - at Osos and Higuera; offers first-rate pizza, wide variety of unusual toppings. Big Sky Cafe - on Broad Street downtown; California/Healthy style, great seafood, unusual entrees and side dishes, excellent. Royal Thai, Foothills Boulevard near Cal Poly; all-around good Thai Food, nice patio. Bali's Self-Serve Frozen Yoghurt - Higuera downtown and also on Foothills Boulevard; excellent frozen yoghurt sold by weight. House of Bread - 299 Marsh Street; fresh baked bread, muffins, and more. Lots of samples. Edna Valley Winery - Biddle Ranch Road - south on CA-227; beautiful tasting room, great scenery, and always reliable wines. Saucelito Canyon Winery- Biddle Ranch Road - south on CA-227; family winery noted for great Zinfandels grown on century-old vines in hills east of valley. Clairborne and Churchill- on CA-227 - south of Biddle Ranch Road; hospitable family winery with very excellent white wines. Giovanni's Fish Market - In Morro Bay. Spectacular fish market - look for awesome dungeness crab and local salmon in season. They also cook and serve their fish at a take-out window. Eat on a great patio overlooking the water. Read our article on Morro Bay, California - Sea Lions and Dungeness Crab. Pismo Beach is one of the Central Coast's outstanding beach towns. It's highlight is Pismo State Beach, which features a wide swath of sand, dunes, good surf fishing, surfing, great camping, and a 1,200 foot visitors pier. Adjacent Oceano Dunes (right) is the only state beach area in California permitting motor vehicles on the beach. The area is famous for the Pismo Clam. Clamming is still permitted on a limited basis. The town stages an annual Clam Festival featuring a parade, clam dig, Clam Chowder Cook-off, and more. Pismo Beach offers numerous accommodations, including motels, RV parks, campgrounds, and vacation rentals. Advanced reservations are strongly recommended in the summer. Pismo Beach hosts one of the Central Coast's most popular 4th of July fireworks displays at the pier. Visitors are advised to arrive very early to obtain parking and seating. The beach is also famous for its Monarch Butterfly Groves. Eucalyptus and pine groves behind the beach host large numbers of the colorful butterfly from October to February. Visit recommendations: Spend at least a couple hours walking this wonderful beach. The state park campground is excellent if you can get a reservation. Avila Beach and Valley offer one of the region's finest microclimates, with less fog and more sunny skies and warm weather. 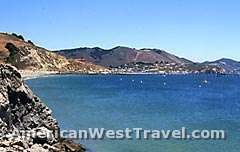 Access from US-101 goes through Avila Valley on Avila Beach Drive or San Luis Bay Drive before reaching the small town of Avila Beach. The town has been redeveloped in recent years, offering a fine beach front, a long pier, and a number of small shops and restaurants as well as a golf resort. Located in a steep canyon covered in oak, Avila Valley (left, the Avila Valley Barn - see below) offers camping, a resort, mineral springs, and fresh produce. Adjacent See Canyon is famous for its apples. Sycamore Springs Resort offers beautiful accommodations in Avila Valley. It also rents by the hour two-person hot tubs with water pumped in from Avila Hot Springs. The tubs are scattered on the steep, shady, oak-covered hillside in complete privacy. You can bring your own wine or buy some at the club house. A spectacular setting for relaxation or romance. The resort also offers massage and other therapies. See Canyon Road, off of San Luis Bay Drive, goes through a canyon rich in fruit trees, especially apples. A number of farms sell their fresh picked wares at very reasonable prices. Most notable is the Gopher Glen Apple Farm which is open seasonally and offers an immense number of apple varieities - highly flavored, juicy and CRISP!. The scenic road hugs a canyon wall deep in the woods with good opportunities to spot wildlife. The pavement ends in a couple miles and becomes well-graded dirt. The route becomes spectacular going through several valleys, then climbing a steep hill with great views at the top. The road finally ends up at Los Osos Valley Road in San Luis Obispo. The Kelsey - See Canyon Winery is also located in See Canyon. The tasting room offers great hospitality and excellent wines in a gorgeous setting. Look for peacocks running around the fruit trees behind the buildings. The Avila Valley Barn offers great fresh produce, home-baked treats (especially the peanut brittle), a kids' petting zoo, and more. Look for "pick your own berries" in season. Visit recommendations: A great place to spend the day. Come back several times if staying in the area. Port San Luis is a harbor district lying about a mile past Avila Beach at the end of Avila Valley Drive. The port is home and launching point for numerous pleasure and commercial fishing craft. The Harford Pier is an outstanding visitor destination, with lunch spots, restaurants, live fish markets, and fishing opportunities. Don't miss the Olde Port Inn (right), one of the coast's top seafood restaurants. Located at the end of the pier, the top floor offers fine dining. The lower floor houses the bar and lunch room. It features picture windows with outstanding views of the coast and clear, plexiglass tables through which you can view marine life around the pier's pilings. Visit recommendations: Worth an hour or two to explore the pier. Check out the fresh catch at the live fish markets. Try to eat at the Olde Port Inn (and order what you saw fresh at the fish markets).